When Javier learns his explosive night with Sophie left her pregnant, he’s adamant they wed! But warm, compassionate Sophie demands more. Can Javier accept that giving her and the baby his all is the key to his redemption? Entertaining Princess Galila at a royal wedding seems frivolous…until she reveals Karim’s family’s darkest secret. To prevent a scandal, Karim will make Galila his convenient bride! BONUS BOOK INCLUDED IN THIS BOX SET! Close to the Edge by Zara Cox. 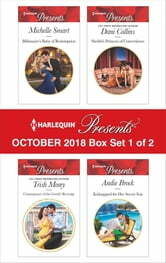 Be sure to collect Harlequin® Presents’ October 2018 Box Set 2 of 2!